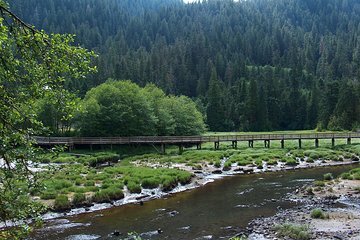 Découvrez les principales attractions et la faune et la flore de Ketchikan au cours d’une excursion de 90 minutes en prenant le tramway historique ou le bus-navette. Inclut une promenade le long de la route bordant l’océan qui mène au Herring Cove, un endroit de choix pour observer les animaux d’Alaska dans leur milieu naturel. Après s’être retrouvé au bureau des visiteurs Ketchikan, montez à bord du bus ou tramway pour une excursion de 20 minutes des points forts de Ketchikan. Découvrez le quartier historique le long de la crique Street, regardez les saumons remonter à contre-courant vers la passe à poissons et d’autres monuments pendant la visite. Ensuite, admirez le paysage de l’Alaska le long des 8 miles (13 km) du trajet pittoresque qui s’arrête sur un point de vue sur une montagne pour prendre des photos. Puis prenez environ 30 minutes à Herring Cove pour observer la faune. Selon la saison, vous pourrez apercevoir des aigles à tête blanche, des phoques, des saumons, des cerfs, des baleines à bosse, ou des ours. Pendant le voyage de retour, vous pouvez descendre pour explorer la crique Street seul ou revenir sur le quai du bateau de croisière, où votre excursion se termine. Worst tour EVER. Do not recommend at all. Though my tour was scheduled for 8:30am, when I got to the shop I was told that they decided to move it to 8:45am with no notice to the customer. The tour was also 11 cheaper than what I paid on Viator or the same price if you wanted to add the Totem tour as well. Instead of embarking on my tour as scheduled, we got to stand with another tour gentleman and listen to him talk nonstop for 30 minutes not 15 as the bus didnt arrive until closer to 9:00am. Once on the bus, the city tour told you nothing and took you nowhere you couldnt easily walk to for free from the ship port. All of the information provided was also information that was provided in the free visitor center brochure. As for the wildlife tour, you drive out on a less than scenic route that does NOT include a mountain top stop with photo ops to Herring Cove. There a bunch of other tours are standing around. Now, if you know ANYTHING about wildlife viewing, especially for seeing bears, you know that the last thing you should do if you want to see them is talk loudly. For the entire 30 minutes we were there, 1 newly arriving tour guide after another would talk loudly about various things about the area. It was noisy, crowded and hardly had any salmon maybe 10! 1. That they are closing the hatchery in the area as salmon dont really come here anymore. In fact, the following season, they would probably be moving the wildlife portion of the tour to the city area instead. The same city area you can easily see for free on your own. 2. That the bears usually only come out early in the morning at around 7am or in the evening. This means they take you to a wildlife viewing area where they KNOW FOR A FACT you will likely see little to nothing. In fact, the only thing we saw besides a few pitiful salmon was the eagle that I pointed out. Sad waste of time, energy and money. My advice? Exit the ship and walk along the pier to the visitors center where you will pick up your maps and info. Next walk along the dock to the 1st stop light Mission. Turn left onto Mission and walk down to Creek Street. Using the information provided for free by the visitors center, you will get more and better information than provided in the tour including info about the former red light district and shops on Creek Street that are dirt cheap as compared to those near the docks. If you hang out near the 1st bridge over the creek you will see salmon, gulls and if youre lucky as I did around 10:30am see harbor seals hunting salmon. Walking around on my own on Creek and Park streets, I saw thousands of salmon, seals, spiders and other bugs, tons of gulls, robin. If you cross the initial Creek Street bridge and walk to your left you will come to a small waterfall as well as the Salmon ladder. If you turn right at Park street and continue up, you will have more views of the hundreds/thousands of salmon and the creek. If you keep up Park street you will hit the hatchery or you can turn right on the road next to the hatchery and also hit the Totem Pole Museum. Its all very close with about 15 minutes to creek street from the dock and about 15 minutes from Park and Creek to the Totem museum. You really want to go to Saxman Totem village or Herring Cove? Take a taxi. Itll be cheaper, you can stay as long as you want and you likely can get down there when there is actually a likelihood that you will see wildlife. This was not the tour I expected. I thought we would get some good history of Ketchican. The tour guide spoke fast and was mostly sarcastic with her comments. We spent lots of time at one location to see bears, which there were none. I know that is not a guarantee, but when it was apparent there weren't any we could have moved on sooner. We did not stop along the road next to the ocean to look for whales. We were to "tell me if you see one and I'll stop". By the time she stopped it would have been too late. I was very disappointed. Was not worth $45. We arrived early and were offer an earlier departure in a minivan. This allowed us to arrive at the river at Herring Cove in tome to see a young bear up close as it walked in the river bed near the salmon fish hatchery. There were many bald eagles there also. Another wonderful Viator sponsored tour. Very good tour. The guide was informative and welcoming. The tour delivered just what was promised. Only disappointment was that the bears weren't out that day. Not his fault. We did see salmon and an eagle. Good guide with a great sense of humour, we saw plenty of eagles, deer, a couple of kingfishers much bigger than the British variety but the bear remained elusive. The guide did say they had seen a bear on the last 9 tours.running and I am sure he told the next tour it was 10 days running. Interesting look around town but very limited wildlife exposure. The town and scenery were great, but our tour guide did not give us much information! Tour was dis-organized. Tour guide knew the town but was not very professional in delivery and customer service.